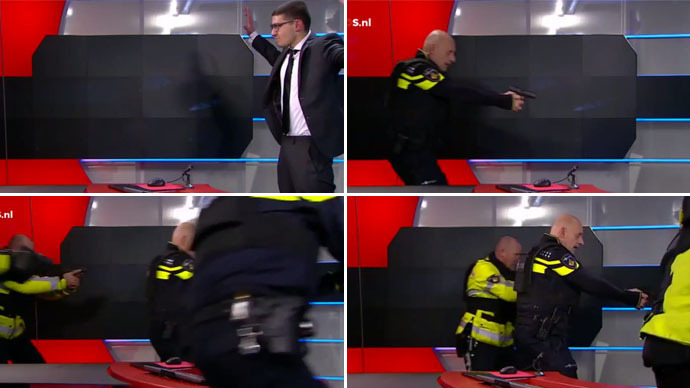 A gun-wielding man broke into the building of NOS, the national broadcaster of the Netherlands, entering the studio control room and demanding air-time. Police quickly apprehended the man, whose motives are still unknown. “We were hired by the security service," added the man, who was carrying a pistol fitted with a silencer. "This is taking too long," he managed to add before police stormed the studio and apprehended him. There were no reports of injuries, as employees were evacuated while police surrounded the building. According to police spokesman Christine Scholts, authorities are investigating who the man is. They are also looking into claims that the suspect has accomplices who have set up explosives around the country. "He took the security guard hostage and said he wanted air time. If they didn't give it to him, he said there would be bombs in different places in the Netherlands that would explode if he didn't get time on TV," Scholts said, as quoted by Reuters. The man reportedly had a letter on him which said: “Eight high explosives have been planted that contain radioactive material. If you don't take me to studio 8 to make my broadcast, we will be forced to step into action," according to RTL news channel. "Realize that I am not on my own," said the letter, the authenticity of which could not be immediately verified. The NOS studio is located in the central Dutch town of Hilversum, some 20 km east of Amsterdam. The incident follows strengthened security measures across Europe after deadly Paris attacks at the beginning of January, when Islamist gunmen killed 17 people at the offices of the satirical magazine Charlie Hebdo and a kosher supermarket.